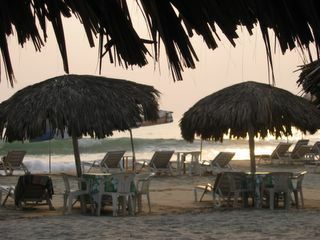 On Thursday evening around sunset, we finally arrived in Puerto Escondido, hundreds of miles down the coast from Acapulco. Along the way we crossed from Guerrero into the much hotter and more under-developed state of Oaxaca (wa-HAH-ka), and we passed through some real no-man’s land, where abandoned cars are stripped and apparently left to rot for decades. We saw a wrecked fuel truck that had overturned and scorched the surrounding brush for miles; the burnt-out remains of the truck were still lying upside down on the shoulder, just a few feet from the highway. 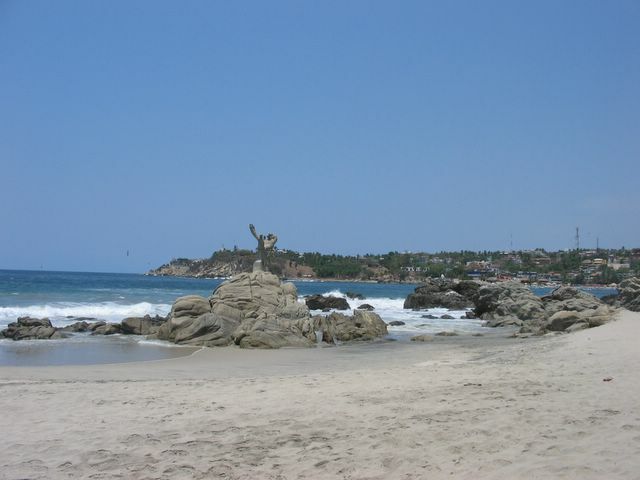 According to the guide books, Puerto Escondido (hidden port) has long been a legendary destination for surfers, as well as travelers looking to make some cool connections. Once we arrived, it was easy to see why. We skipped past the main part of town and headed straight over to the east-side beach where the action is, Playa Zicatela. Here is the main surfing beach, about a mile long, paralleled by a single dirt street lined with moderately priced hotels and youth hostels, as well as a plethora of international food options, beach-side bars, and (surprise!) decent music. And everywhere you look there are tourists from all over, some speaking with Australian and British accents, others speaking French, German, and who knows what else. 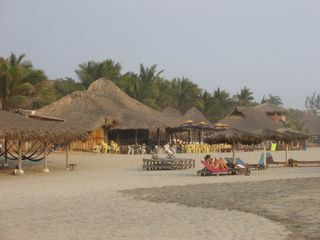 On Playa Zicatela, the white-skinned people definitely outnumber the Mexicans, but hey, we were ready for a break! Seriously, the food options here really took us by surprise. Almost every single restaurant offers multiple vegetarian options, so Carley was in heaven. One night we ate at an actual Japanese-owned sushi restaurant, Sakura, right on the beach with our feet in the sand, the waves crashing down only 70 or 80 feet away. The next morning we ate breakfast at an Italian-owned place with a menu that rivals any of the over-priced Italian places we’ve sampled in the San Francisco Bay Area. That afternoon we sat at a beach-side bar drinking cheap Coronas and listening to an endless stream of classic rock oldies (The Doors, Beatles, Stones, Animals, etc. 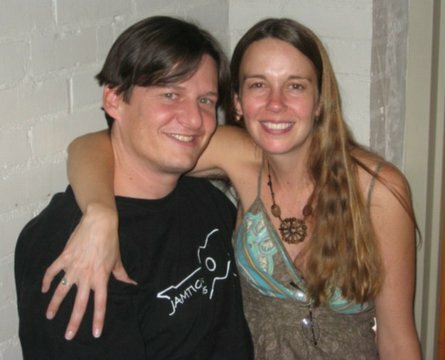 ), most of which we hadn’t heard since college. The most amazing thing about Puerto Escondido for us, though, was our hotel room at Hotel El Aleman (the German). Set a few blocks away from the main action, this place was the cheapest hotel we’ve had in Mexico ($15US per night) and also the nicest and cleanest! Our view of Puerto Escondido while rocking out to the Classic Rock oldies. 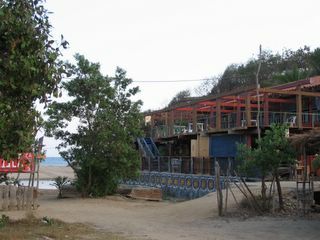 Needless to say, we had to spend 2 nights here in Puerto Escondido. It was too nice here to think about leaving! By Saturday, however, we realized we had to get the ball rolling again. Our next destination was Mazunte, only a 45-minute drive southeast from Puerto Escondido. Mazunte is a small beach-side village that used to be a slaughterhouse for sea turtles, until the practice was banned in 1990; now it is home to an ecological turtle reserve and aquarium where tourists can pay to see all 7 of Mexico’s huge marine turtles up close in big glass tanks. 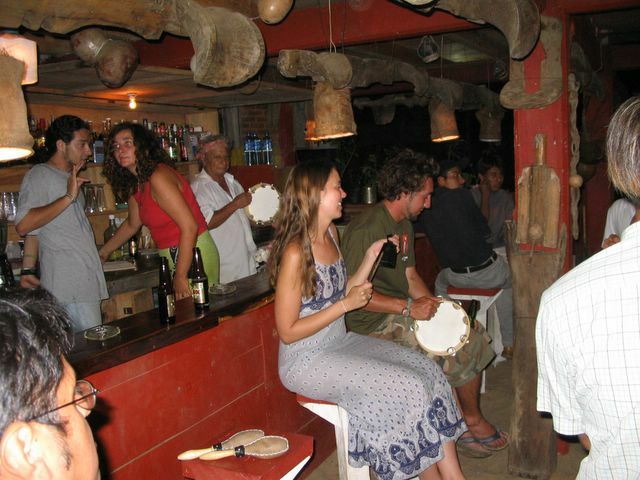 Mazunte is also very close to a few other popular beach-side villages – Puerto Ángel and Zipolite. 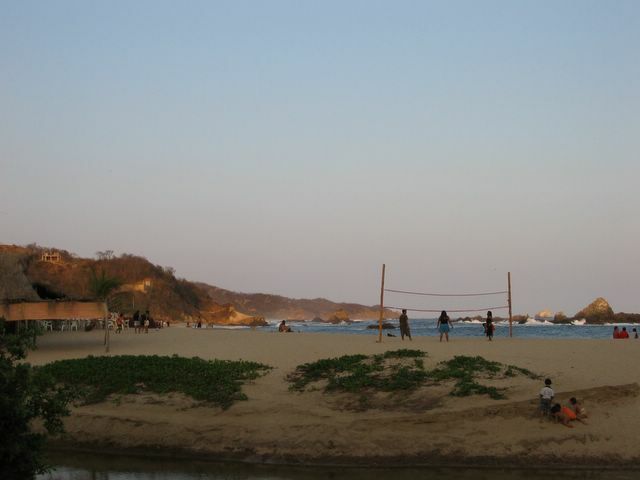 However we chose Mazunte because it was the only village that offered tent camping on the beach. 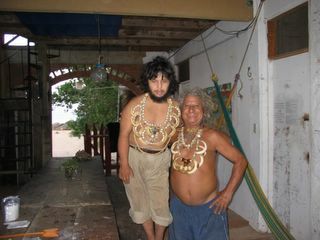 Our camping plans were disrupted, however, by Carlos “Einstein”, the legendary (infamous?) 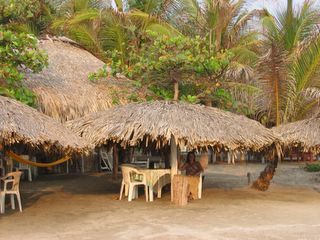 proprietor of a beachside youth hostel. Seriously, this guy is a real character, full of friendly gusto and generosity, a real party animal, complete with wild white hair reminiscent of the famous German scientist himself. He greeted us with a bellowing “!Bienvenidos! Welcome! Welcome my friends!” Within minutes of Carley inquiring about a space to pitch our tent, we were handed shots of mescal de mango (mango-flavored mescal, a Mexican whiskey made from the same agave plant as tequila), followed quickly by a round of mescal de café (coffee-flavored mescal) shots. So we were won over, despite the fact that there was nowhere for our tent and we’d have to stay in a dungeon of a room with a putrid stench. We spent very little time in the room, as it turned out. We enjoyed an afternoon in the 95+ degree heat on the beach in front of the hostel. The beach was mostly empty, even on a Saturday afternoon. The water was great for swimming, yet the waves were still big enough for some serious body-surfing. Then as we sat to eat dinner at the bar of Carlos Einstein’s, the action really got started. 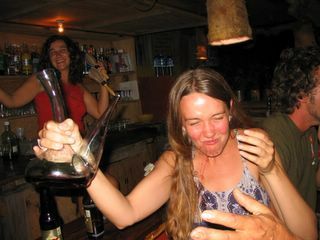 The shots of mescal kept coming, mostly without our asking for them, as Carlos seemed to have an interest in getting us drunk. Soon we had made friends with Stefanee the bartender, who was actually a French tourist who was working for Carlos to pay for her stay at the hostel; and shortly after that we had gotten them to play some of our CDs on the sound system. Later a local singer/guitar-player showed up and played some upbeat Mexican folk songs to a crowd of 20 or 25 who had shown up. 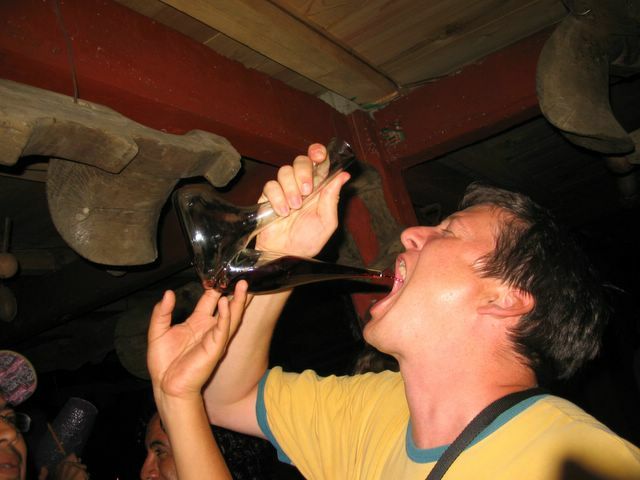 All the while, Carlos Einstein was in serious party mode, handing out shots of mescal and blowing loud blasts from his conch shell. At one point he handed out musical instruments (cowbell, shaker, tambourine, etc) to many of us in the audience, and then we were all in the band, backing up the singer in a drunken dance party. 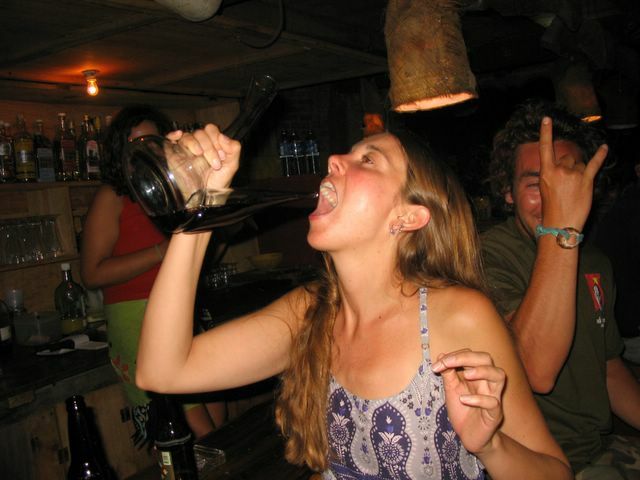 At another point even later in the evening, Carlos Einstein brought out a glass pitcher full of red wine and took turns pouring it into the mouths of his drunken guests. Needless to say, we were extremely hung over the next morning when we were awakened around 9am to the sound of Carlos bellowing his greetings to some potential new guests. We groggily downed our breakfast (at least this came free with the stench-hole of a room), and then decided we really needed to hit the road. The simmering heat and humidity were really starting to get to us. Carlos gave us a good recommendation for a hostel in the small mountain town of San José del Pacifico, and we were on our way to a much cooler ambiance!